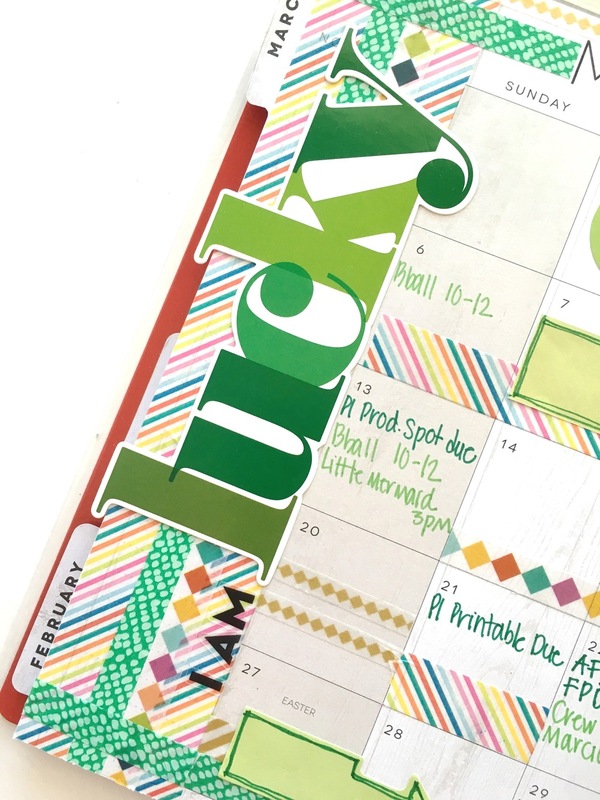 "I am lucky" is the sentiment mambi Design Team member Mary-Ann Maldonado (blog | IG) used on this monthly layout in her Happy Planner™, and WE ARE LUCKY that she provides so much beautiful holiday-themed inspiration every month! "I am ready for March! Leprechauns and all. What other colors would you choose for March? I dug out anything I had that was green, rainbow and gold. I wanted to keep this month fresh and bright, and for April - I will probably do pastels, even though Easter is in March this year. Who cares, it is my planner, right? I used the clear Dashboard to attach all of the sticky notes and embellishments I plan to use for the month. All that I stick to the dashboard is removable, so these can be changed every month. Not sure where I will use the rainbow SOFT SPOKEN™ sticker but it will fill my planner somewhere. I also attached appropriate pocket cards with a binder clip on the lower portion of the dashboard. I can easily disconnect what I want and re-clip the rest." Shop supplies Mary-Ann used by clicking on the items below. For more St. Patrick's Day inspiration, head to our St. Patrick's Day Gallery page. 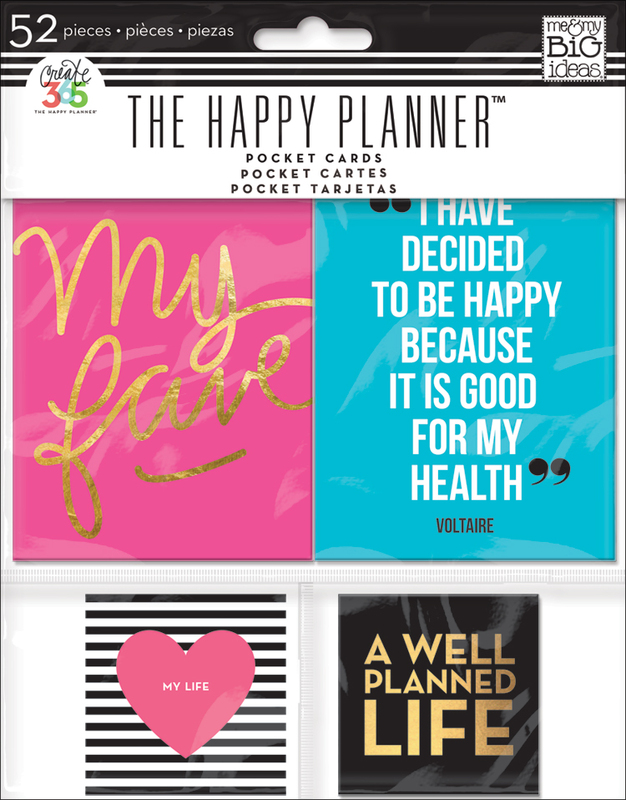 Your Happy Planner™ is what you want it to be. Today we're sharing how mambi Design Team member Heather Adams created a daily fitness tracker for the next few weeks using the new black & white striped notepaper from the Happy Planner™ line along with some colorful and inspirational accents. "Did you know that you can make a simple fitness planner out of everyday products? I wanted to share a personal fitness challenge project I've made with everyday Happy Planner™ products for those of you who haven't purchased the fitness-themed products yet. I was inspired by Amanda's 'a Mile a Day in March' challenge and knew I couldn't participate all month since the last week I will be on vacation. So, I decided to add a few more challenges and make a little daily checklist for now until vacation!" 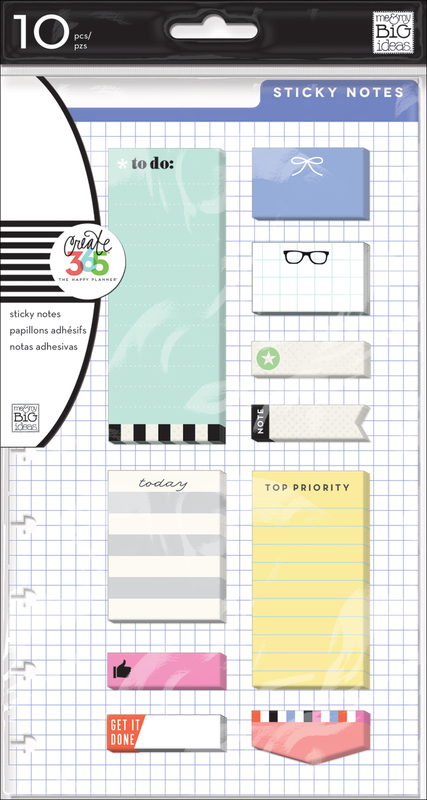 "I used the notebook lined paper that comes in the new Notes & Graph Paper pack to house all of my info. I made a chart on the papers with a bright yellow marker (catches your attention, doesn't it?) and used a date stamp to add all the days I would be doing the challenge. 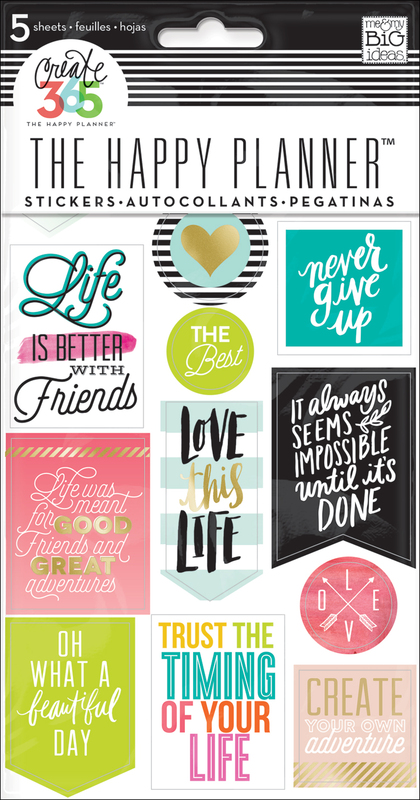 Of course I added some inspirational quotes from the 'Get it Done' and 'Life Quotes' sticker packs as well. I also used different colored inks and pens to mark down my goals and checklists for each day. I hope that making this mini personal fitness challenge planner will help me stay on top of my intentions. 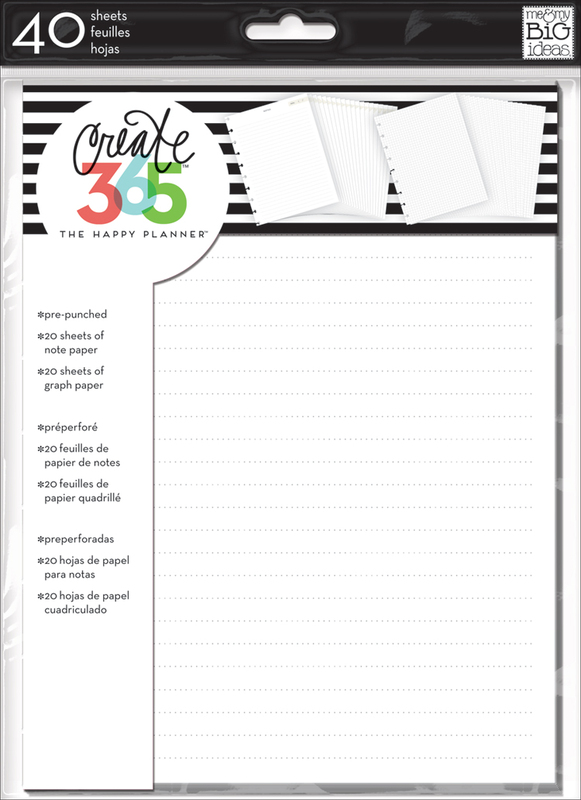 I also hope that you are inspired by the everyday planner products you have and that you will use them for themed project planning!" You've probably heard a bunch of us memory keepers participate in a 'Day in the Life' documenting event or even a 'Week in the Life' documenting challenge, but with today's blog post mambi Design Team member Jennie McGarvey uses the phrase 'Year in the Life' to describe how she's planning to use her Happy Planner™ for 2016. "After going back and forth -- then back and forth again -- I decided to use my Gold Foil Dot Happy Planner™ as a MEMORY PLANNER. Mind blown. I could take the daily details and pair it with everyday photos. This is going to make my Happy Planner™ like a 'Year In The Life' album which makes me so excited, as these are the details we forget. I start with decorating my planner, putting in our activities and events. Then, I add in the photos + journaling (which is pretty minor.). DONE. I get to combine planning and memory keeping, both of which excite me!" 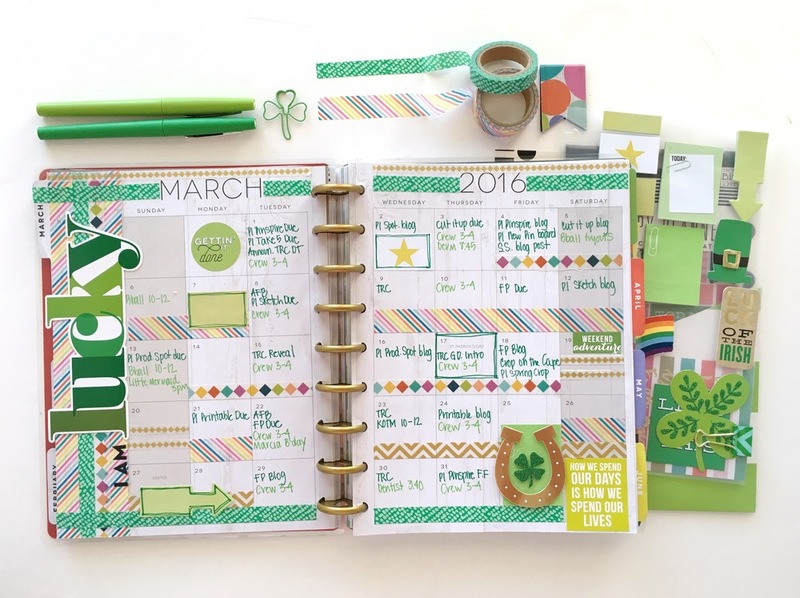 There are so many great things going on in this full February weekly layout in The Happy Planner™ of mambi Design Team April Orr. 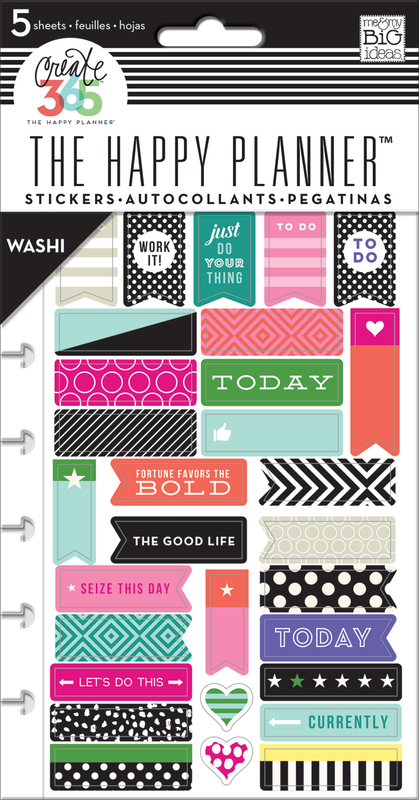 Date-stamped days, pink dotted washi, gold foil stickers, and April's new obsession with sticky note checklists -- to name a few of them! Another interesting thing April did on these pages is to use the top, middle, and bottom boxes in the weekly columns for different things: top = To Do items, middle = important projects coming up, and bottom = less important reminders. April included a new Happy Planner™ page protector in the middle of this spread with a sweet photo of her and her son, Jake, on his 7th birthday slide right into it! Love how the pocket cards she chose to include not only capture the feeling in the photo, but coordinated perfectly with the pink, blue, and gold in her layout. It's greens, black & white, and gold for mambi Design Team member Thuy Bui's monthly marker page for March! We love how a few green embellishments coupled with green-hued markers fill this page with minimalist holiday cheer! 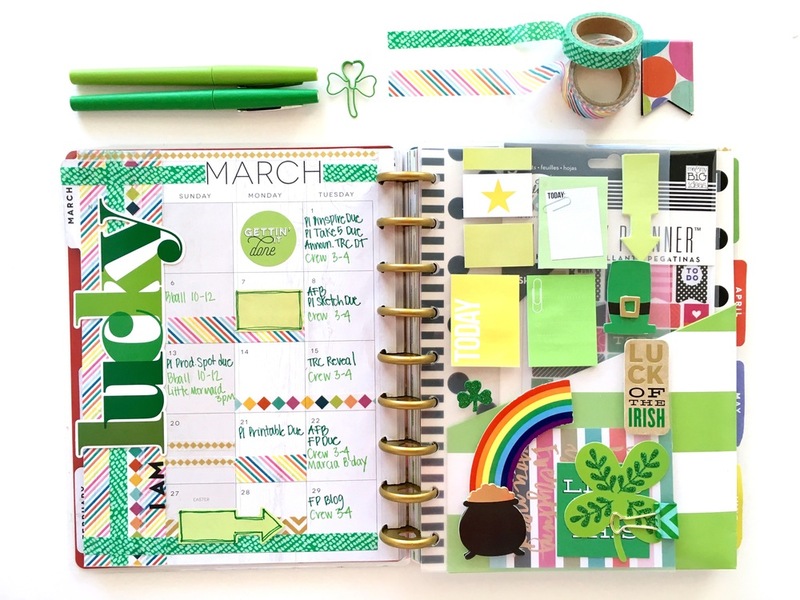 Not to mention the gold foil 'make your own luck' print washi taped right onto the fun polka-dot tabbed March page. 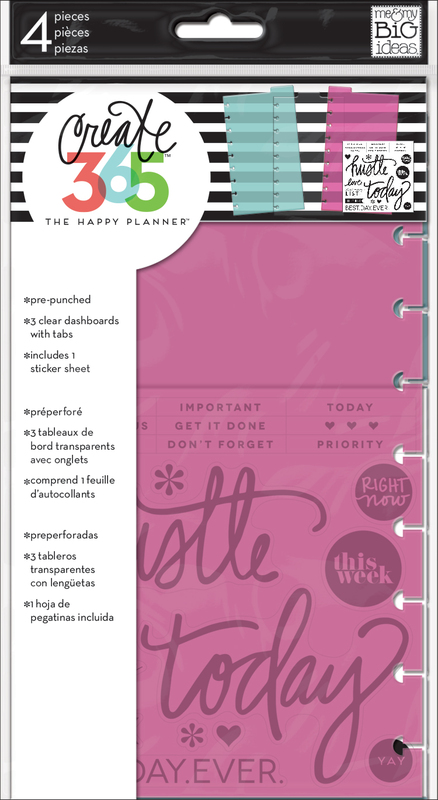 Adding elements to your Happy Planner™ from our DIY Gallery Art Pads is a great idea! 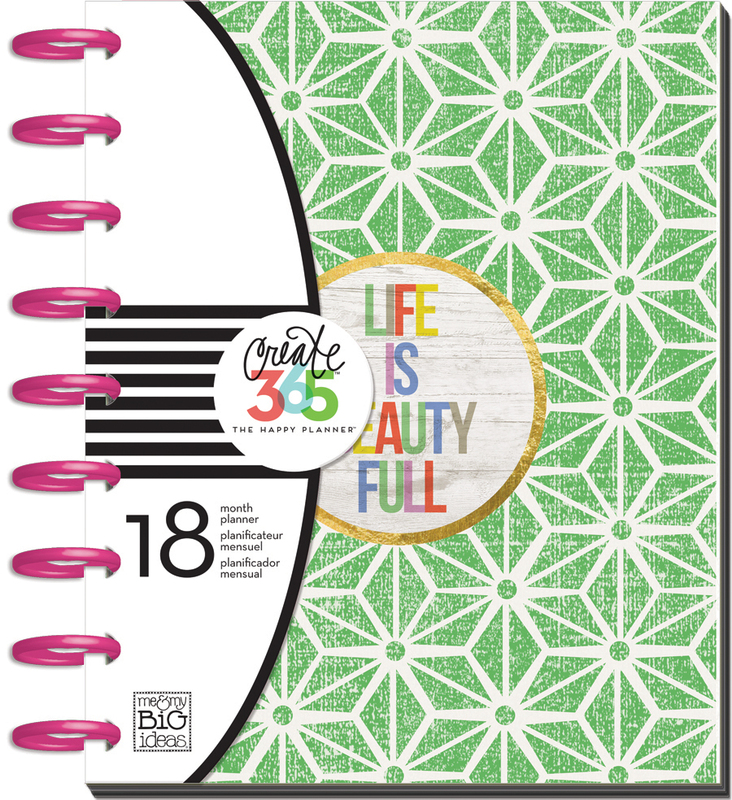 Thuy used washi tape to include the art print into her planner, but now with the Happy Planner™ Punch available, you can easily punch a print right a into your planner, and move it from week to week. Shop supplies Thuy used by clicking on the items below. When it comes to tracking workouts, logging food, and setting fitness goals - mambi Design Team member April Orr does wildly inspirational Happy Planning™! This two-page spread in which she combined The Happy Planner™ Fitness Extension Pack, Recipe Extension Pack, and the new Page Protectors & Pocket Cards is no exception. 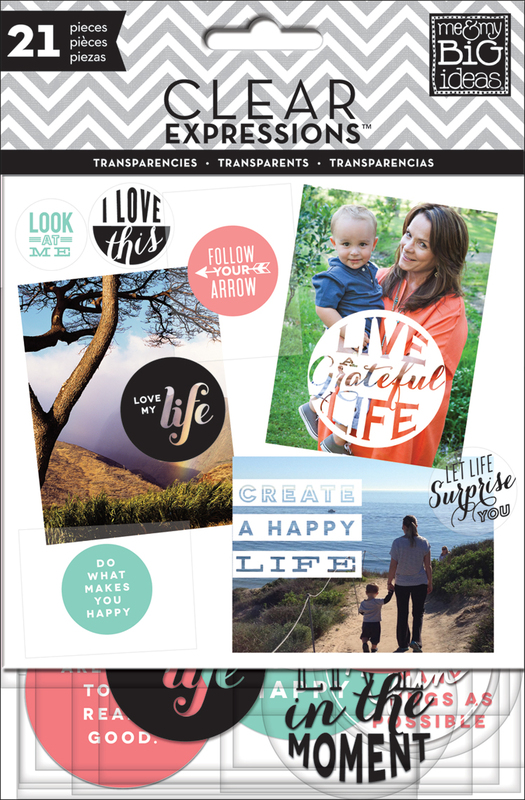 "It is SO FUN to use the new Happy Planner™ Pocket Pages to house inspirational photos and quotes, as well as recipes I want to try/use. 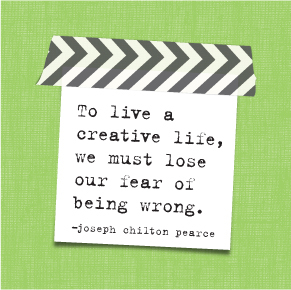 Love all the possibilities! For this layout, I trimmed off the punched edge & sides so the recipe extension page could fit right inside the pocket. No wasted time searching for the recipe." If you memory keep in your Happy Planner™, than you know how satisfying it is to print a page full of photos, cut them out, and place them in your weekly columns. Be still our life-documenting hearts! However, sometimes a photo is special enough to treat a little differently, and make stand out from the crowd. ENTER: mambi Social Media Coordinator Amanda Rose Zampelli's idea to include a full-page photo documenting your special occasion. "I captured this photo of my boyfriend and I on Valentine's Day this past weekend, and isn't it sweet?! To turn it into a full page in my Happy Planner™ I resized it in Photoshop to 6.6in x 8.8in (the same way I explained how to resize photos in Photoshop in THIS tutorial video) and adhered it to a pre-punched notepaper from the Notes & Graph Paper Extension Pack. Then, on the monthly spread for February, I added another photo of us in the February 15th 1.5in x 1.5in square. This way - whether I'm in the weekly pages or monthly - I'll be able to pinpoint the date these pics were taken." Shop supplies I used by clicking on the items below. Hip hip hooray for the power of sticky notes! 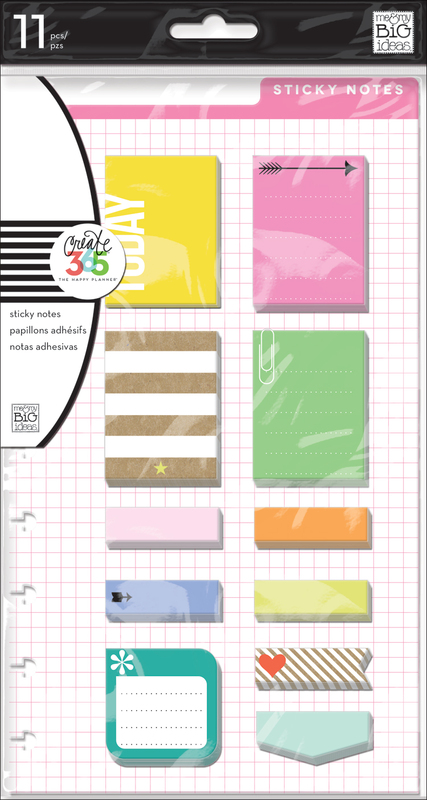 Today we're sharing this weekly layout by mambi Design Team member Heather Adams in which she takes advantage of all that makes sticky notes great - moving them around to keep her on task and organized. 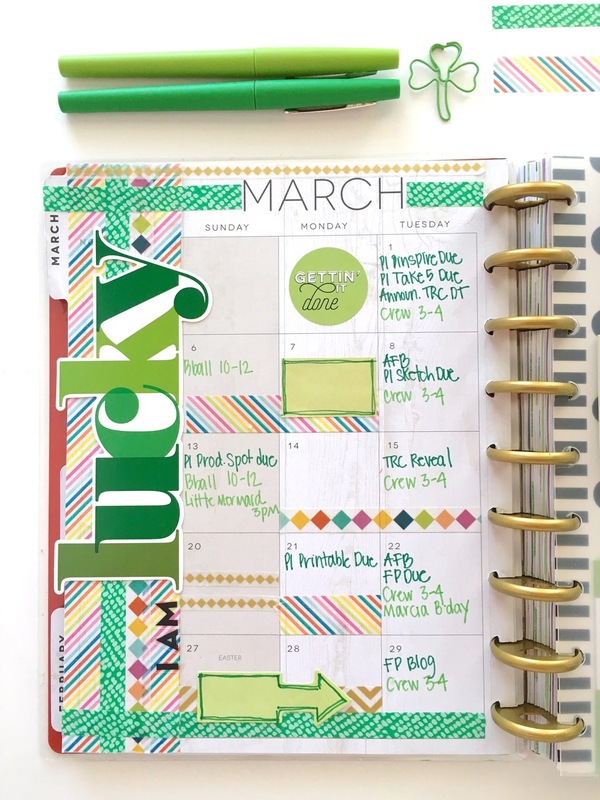 "One of my favorite things about my planner is that I can adjust things from week to week. Using sticky notes makes it even easier to do this! In this planner spread, I transferred a 'ToDo' item that was written on a sticky note from the previous week to this spread. I have gotten into the habit of always making the left 'notes' column my sticky notes column. That way it's not a big deal if I don't get those things done in the particular week that the notes are in. Since the tasks are on sticky notes, I can also easily move them to days where I think the events can get done. 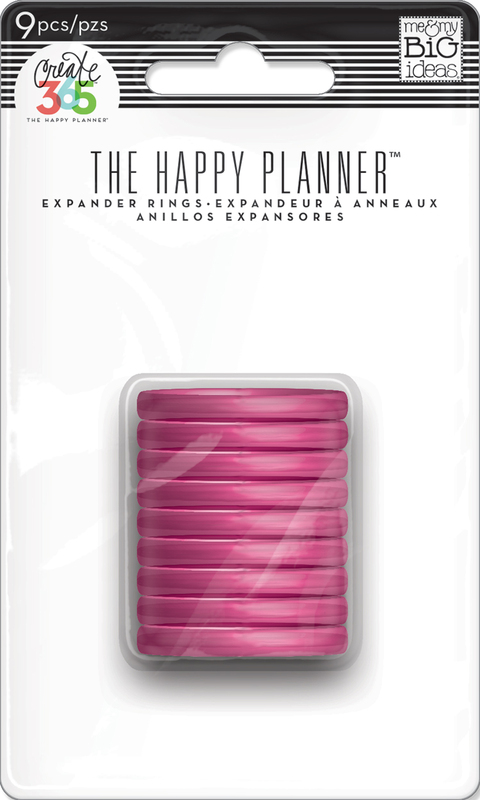 I suppose I'm just trying to say that sticky notes are SO handy in The Happy Planner™!" When your daughter falls in love with baking, and you have a Recipe Organizer Extension Pack and some mini gold discs lying around, you make her a mini disc recipe book. That's exactly what mambi Design Team member Jen Randall did with her Happy Planner™ supplies, and the result is culinary cuteness! "When I saw the new mini discs for The Happy Planner™ my mind exploded with all kinds of ideas for different mini albums. The possibilities are endless! One of my first ideas was to use the Recipe Extension Pack to make a sweet, fun place for my daughter to record her love of baking. She has recently fallen in love with all things kitchen related, makes all kinds of different recipes and recently began a cooking class. Combining the Recipe Extension, with the brand new Page Protectors & Pre-Punched Note Pages, she has all kinds of options to record her culinary adventures. I just LOVE that I can give her a gorgeous place to keep everything organized!" "This would be a GREAT gift for a new bride, an aspiring chef, or someone in your life who has a love for cooking as well. The new mini discs make the process of putting this together so easy! 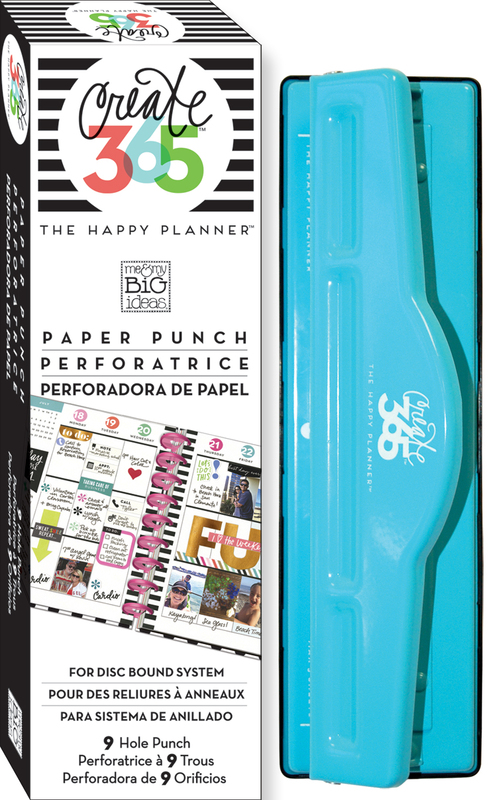 Using the new The Happy Planner™ Paper Punch allows you to add all kinds of fun things too. I added 4x6 and 3x4 Pocket Cards as well as photos. But, how fun would it be to add recipe cards, business cards from a great restaurant, cooking class notes, menus, etc. There are so many ideas. I can't wait to make more!" Shop supplies Jen used by clicking on the item below.